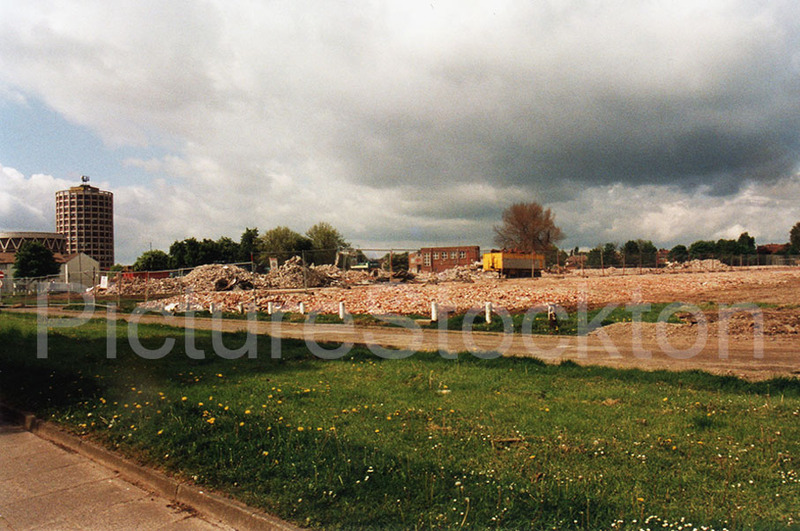 These photographs were taken by my late uncle, Albert Abbott, they show the demolition of the Technical College on Finchale Avenue in Billingham in 2003. Many thousands of people passed through this establishment learning scientific, engineering and artistic skills and went on to many different occupations, teaching, acting, engineering and much more besides. As a child I remember it being built and it was a terrific playgound for young boys, heaps of sand and gravel, piles of bricks and holes filled with water,we could get dirty and damp within a few hundred yards of our homes, sheer magic. In later years I did evening classes there, night school as we called it, at both the Billingham and Oxbridge sites and also went to the theatre a number of times, including the opera ‘Don Pasquale’ with my school music club, my first and last foray into the world of opera. It had most likely past its usefulness with the rise of University education for all and a lesser requirement for technical skills as industry faded away and administration and service work increased, still, it is always sad to see something you have grown up with disappear forever. Photographs and details courtesy of Bruce Coleman. It is such a lovely memory. I did my A Levels from 1973-1975. It was golden days full of fun and enthusiasm. Commuting daily from Stockton YMCA with friends is something to remember. I remember Friday nights too, both the pop stuff and the Northern Sinfonia orchestra, which played there once a month, alternating with Middlesbrough Town Hall. Before that a gang of us used to go to the youth club and play table tennis. Dorothy Hirst never did manage to teach me to bop! 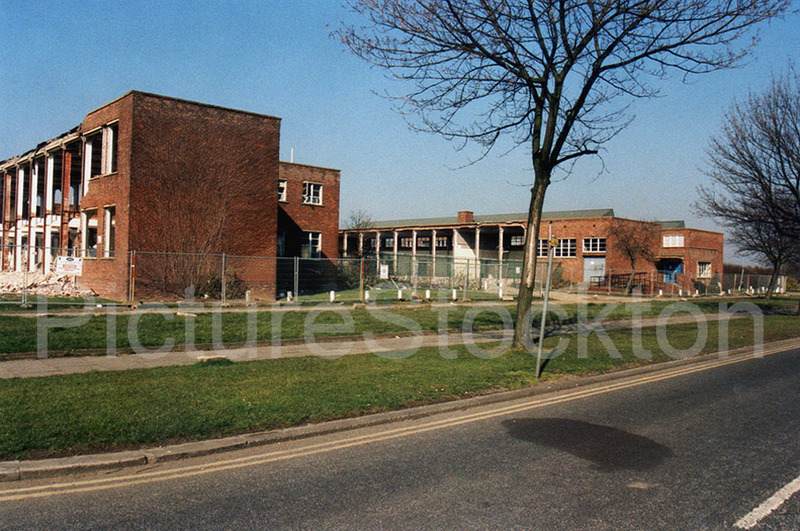 I don’t know if many people will remember this but when the college was first built and before it was used by the students, the building was used by Billingham North Primary School (Pentland School). I think the school was being redecorated and so to ease matters the 1st and maybe 2nd year juniors were housed in the new College building. This was 1954/55, my first year in the juniors. 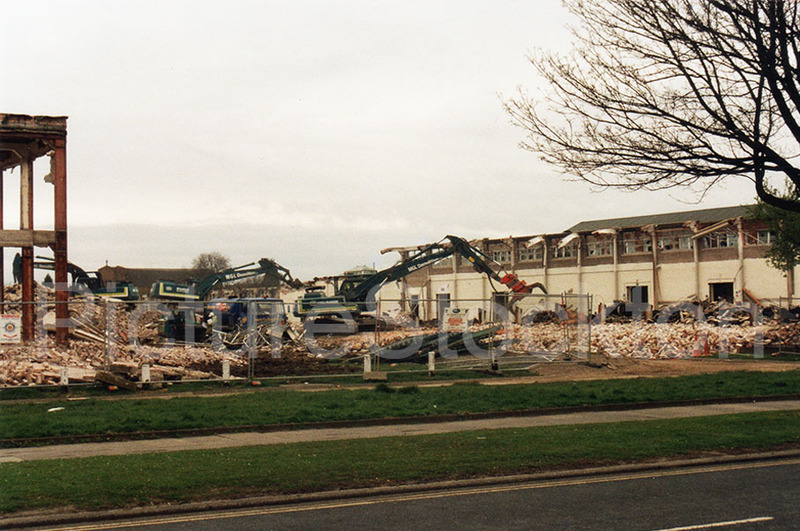 We had only recently moved from Haverton Hill so you can imagine how much of change this was going into brand new classrooms away from the pollution. Hi Margaret Hatch! I remember too. We were in the same class. I was at the tech in the early 60s, and enjoyed too much freedom to achieve much then. However, I learnt to love the arts doing drama with the supremely camp Ken Parkin. I remember taking every free moment in the music room listening to the newly released “Please Please Me”. I also loved going to Friday gigs with local bands and towards the end of the 60s I acted as DJ for a number of bands there including Marc Bolan and Steve Peregrin-Took as T-Rex. I wish the powers that be could have retained the theatre which could accommodate much more than the Forum, particularly in light of the loss of the Billingham Arms hall. Did my O levels there on full time 2 year course. Brilliant teachers gave me a springboard to a successful career. Happy memories of the Billingham Tech. I worked as a lab technician and other jobs in the college in the 1980s. I pugged clay in the pottery room and delivered the mail in the college and took the exam papers to the town centre post office. I used to travel to work in a robin reliant a bit scary in the winter but good fun. Lots of good memories of ‘Billy’ Tech in the early sixties. It gave many people a ‘second chance’ to take G C E exams, which many profited from. I remember Room 90 upstairs at the end of one of the wings near to Finchale Avenue. Many of these rooms internally were bare grey brick with the steel supporting girders exposed. The story was that economies at the time of building meant that the brickwork remained un-plastered in these areas. I remember it being built. Our house was near the bottom of Roseberry Road, and the site was a great play ground for local kids. We used to play tennis on the local unfenced court, and the large playing field, between the college buildings and Sidlaw Road houses, was ideal for football. Some years later in the early 1960’s some of my friends and I would play snooker in the Community center. I attended a GCE Geography course at night school at the college in 1964, prior to joining the Merchant Navy, and I remember looking out of our front window at night, and seeing all the young women going to typing classes. You knew when they were coming by the tapping of high heels on the pavement. Before the college was built, I could see the houses of Greatham from our back bedroom window. The college was part of a huge 1950’s building boom in Billingham, which saw the construction of the town center, and large numbers of council houses, east of the A19. I did my “A” levels at night school there, Chemistry, Physics and Geology, passing them in 1967 and going on to do a London BSc at Sunderland Polytechnic. The lecturers were great. Always rather sad to see the demise of a location where one has gained an advantage.